An essential part of learning anything new is getting comfortable with it, this is usually through practice & use of the knowledge gained, however it is not always easy to get the required practice which is an essential part of how we gain our confidence with the tarot. I often find that my students are all fired up with the knowledge they’ve gained on my Intuitive Tarot Workshop but frequently find they have nobody they can practice on, especially if friends & family are not really into tarot or spiritual beliefs. You may simply feel that you’ve exhausted your loved ones when it comes to reading for them and simply need new blood to work with (it is way easier to learn working on strangers)! To help those of you who need a way to gain more practice I have created this second step on your journey, where those who are learning to master the tarot can come & get practice, & meet other like-minded people, plus it’s a great place to talk about your experiences, swap ideas, try different tarot decks and so much more. Whether you have studied with me or whether you studied elsewhere or even taught yourself, this workshop is the perfect way to further your knowledge & gain more confidence with the tarot. 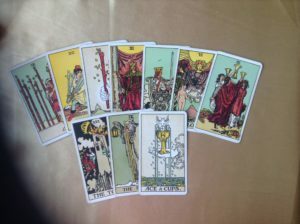 When you are ready you may want to check out my Fledgling Nights where you can read for people I have hand selected to help further your tarot journey. This is a full day of working with the tarot in a practical way, by the time you finish the course you will have a stronger connection to your cards, feel more relaxed with them and see your readings become more fluid. Course investment £135. Don’t miss this course, book now using the link below or contact me if you wish to pay in instalments. Courses must be paid for in full before the workshop date before your place can be confirmed.